To understand this information better, please watch this video (9 mins). When the 24 bones or vertebrae that protect the spinal cord lose their normal position or motion, this is known as vertebral joint restriction/misalignment/subluxations. Chiropractic adjustments are performed to move these vertebrae back into position. Chiropractic adjustments could be compared to braces on the teeth, as when braces are placed on the teeth they slowly move the teeth to straight. Adjustments are performed on the vertebrae and these adjustments slowly re-align the vertebrae. Muscles, tendons and ligaments are attached to the vertebrae and often these soft tissues have to be worked on too to allow the vertebrae to change their position. There are hundreds of ways to adjust the spine. Usually Dr. Barbara Rodwin uses her hands deliver a brief and highly accurate thrust. Chiropractic adjustments help normalize spinal function and avoid bone and soft tissue degeneration. When nervous system function improves in this way, the body can begin the natural healing process. Chiropractic adjustments are so safe that even newborns, children and pregnant patients can receive adjustments to repair the damage caused from the following: the birth process, early childhood trauma, learning to walk, falls, spinal curves, improper posture while sitting, sleeping, lifting, and sports related injuries. 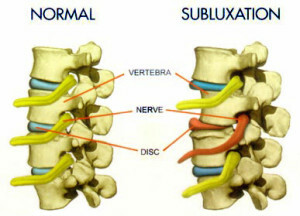 What is a Vertebral Subluxation? It is a misalignment of a segment of the spine, or “vertebrae”, which causes an irritation to a nerve and a loss of normal function. It can be caused by any stress (physical, emotional, or chemical) that a person cannot adapt to. In other words: Vertebral Subluxation = Vertebral Misalignment = Vertebral Restriction This will cause improper nerve impulses going to all muscles, tendons, ligaments, cells, tissues and organs of the body, which can result in loss of motion, stiffness, discomfort, pain and even nerve symptoms! The discomfort/stiffness/pain can come and go. However if the true cause of the symptom cycle is a joint/vertebral misalignment and nerve, muscle, tendon, ligament adhesion/scar tissue, the problem will re-occur. The pattern is often that the symptom starts to reoccur more often, and then it may start to last longer when it does occur. The initial cycle is acute (the first few days after the injury), and chronic (may last months or years post-injury). Depending on the person and the injury or condition, the duration of the symptom cycle can vary.With chronic conditions, the symptom cycle takes longer to go away. In fact, it may become acute again during times of ‘flare up’, causing an increase in discomfort/pain and reduced mobility. This is why if you have a chronic condition you may have periods of time where you are almost or completely symptom-free, and periods of time where you are symptomatic. With chronic conditions, it is especially recommended you have periodic adjustments, as this will help to maintain the health of your spine, joints, muscles, tendons, ligaments and nerves, which will in turn improve your overall health. Click the image to find out more about Active Release Technique which is provided by Dr. Barbara Rodwin (D.C.) and Andrew Bouchier (Registered Massage Therapist) at our clinic. The Active Release Technique works on a muscle, tendon, ligament or nerve which is injured, imbalanced, and inflexible and then an adhesion (scar tissue) will form between fibers. This impairs oxygen and blood from getting to muscles. Adhesions (scar tissue) create barriers in these tissues, resulting in a muscle, tendon, ligament or nerve which is not acting efficiently (non-compliant). Non- compliant tissues exhibit poor circulation, weakness, inflexibility and muscle tenderness or discomfort. Dr. Barbara Rodwin has been trained to feel the adhesion, and manually relax the tissue by getting under the adhesion with her fingers or thumb. The tissue is then moved through its stretch motion while applying pressure, breaking up the adhesions/scar tissue. Acupuncture is a great way to stimulate healing! Click on this image to learn more about acupuncture. Acupuncture has been studied extensively by Western medicine to determine scientifically how it works. When the acupuncture needles have been placed into the body physiological reactions occur that change the following: there are changes to peptides, neuro-transmitters, pain receptor fibers, inflammatory mediators and other receptors that work on healing. Our body then reduces the inflammation, decreases the pain, and promotes a healing response to the area. Acupuncture has been shown to increase flexibility as well! Dr. Barbara Rodwin is a certified Doctor of Acupuncture. Interferential Current Therapy (IFC) is a treatment to aid the relief of pain and the promotion of soft- tissue healing. It produces electrical currents that pass through the affected area of the body which decrease swelling, reduce pain, and decrease muscle spasms. Relief Care (Phase 1) – At this phase, your acute (recent) or chronic (long-standing) conditions have damaged your vertebrae, joints, nerves, discs, muscles, tendons, and ligaments. You may have experienced height loss, low energy, poor posture, stiffness, tightness, discomfort, tension, and physical or emotional pain. During this phase you will receive treatment to relieve your symptoms and if there are imbalances in the muscles, tendons, ligaments and nerves you will be receiving work on these. As well you will be advised on changes to be made to sitting, sleeping, sports, and other daily activities that may be causing issues. Corrective Care (Phase 2) – At this phase, your spine, muscles, ligaments, tendons and nerves are beginning to respond to treatment. Your symptoms are improving, including less pain and stiffness. You may find you have increased flexibility and range of motion. You may also find your general physical and emotional well-being improves. During this phase you will receive treatment to correct the cause of the problem. Preventative Care (Phase 3) – At this phase, your treatments are holding for much longer periods of time, requiring fewer visits. Your vertebrae, nerves, discs, muscles, tendons, and ligaments are healing, increasing your overall function. You may find your general physical and emotional well- being is greatly improved, and your stress levels are diminished. 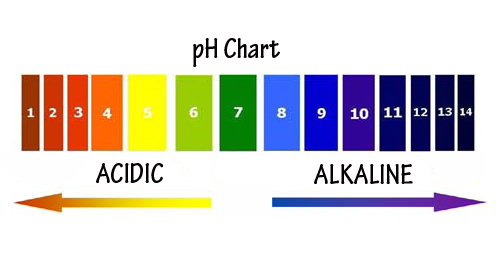 During this phase you will receive periodic treatments to prevent the reoccurrence of the problem and to increase overall wellness. Reactive: You receive treatment only for pain or the cause of specific injuries. This type of care allows you to come in when a problem occurs and receive treatment. This is the “if it is not broke, don’t fix it” approach to treatment, where you only come in if you are symptomatic (having discomfort). This is Phase 1 and 2 of Care. Proactive: You will receive care when an injury occurs, as well as periodic check-ups as a method of preventative care. This is the “oil change”, maintenance approach, where, much like how your car gets tune-ups, you come in for periodic checks to ensure your overall health. With Proactive Care, you are participating in all Phases of Care. If you have had a broken arm when the cast came off the arm was stiff and weak, wasn’t it? Or, think about the bruised, skinned knees and elbows you’ve had. They’re pretty stiff and sore when they’re healing, aren’t they? And if you had a fever with a cold, you felt stiff! Once in a while, the same sort of uncomfortable things happen when a long-misaligned vertebra is going back into its normal, healthy place and adhesions/scar tissue are being broken up in your muscles, tendons, ligaments and nerves. We call these reactions recovery symptoms and, like any other healing in the making, they are nothing to fear. They can include headaches, dizziness, soreness of muscle, tenderness of the spinal joints. The degree of discomfort varies, of course, with the individual and the severity of the condition. The recovery symptoms normally occur during the first phase of care, relief care. The mechanics of these potential symptoms in your body can best be understood by explaining that the vertebrae of the spine are being adjusted to a normal position. This calls for certain physical changes that involve bones, muscles, ligaments, nerves, blood vessels, connective tissue and cartilage. All these tissues and structures must adapt to the new, normal, healthy position. It is understandable then that this structure alignment, which frees trapped nerves, might produce some symptoms of change especially if one has had many years of debilitating nerve pressure or irritation. Let Dr. Rodwin know if you experience these recovery symptoms. Ice should be used on the area you are having treated. A soft gel ice pack can be placed in a towel and onto the area and left on for 15-20 minutes. This could be repeated again in one hour. 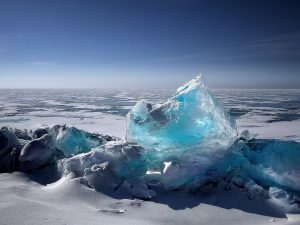 People often think of ice for a new injury and not an old one. They also associate ice with the area being inflamed or swollen. Ice does work for other things as well, and ice aids in the healing of soft tissues. So if you feel even tightness, discomfort and not pain, ice can aid in decreasing the symptom and healing the area. NEVER apply heat to a new injury or any area that is painful or swollen. The heat will cause too much blood flow to the area, which may contribute to more inflammation. When in doubt use ICE as heat may worsen the problem. If you have recovery symptoms place ice on the area. Icing can help reduce inflammation and swelling to help you heal faster! Always allow yourself a few moments to rest and relax directly after your adjustment. Avoid sudden twists or turns of movement beyond normal limits of motion. Watch your posture at all times; stand tall, sleep tall and THINK tall! 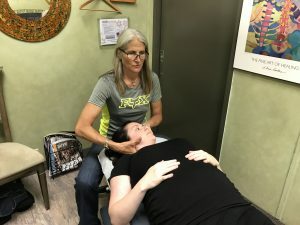 If you are wondering about a particular activity that may be bothering your body, please ask either Keri-Lyn Dudgeon or Dr. Barbara Rodwin about it. When working at the counter in the kitchen, you can open the cupboard door and place a foot on the shelf. This acts as a foot stool and keeps pressure off the spine. Sleep on your back (with a pillow under your knees) or on your side (with a pillow between your knees) with your legs bent slightly. You should never sleep on your Please do not have your hands under your pillow or above your head. Rise from your bed by turning on your side and swinging your legs off the bed. If the mattress too hard, put a blanket underneath you. Back to Health Wellness Centre is a multi-disciplinary clinic, which means we have a variety of services to offer you to help you achieve optimum health. We offer chiropractic care, Interferential current therapy, custom orthotics, registered massage therapy, acupuncture, active release technique, personalized stretching and strengthening programs. All treatments are a choice. We will advise you on what treatments may work best for you, but it is up to you to decide which ones you’d like to use. If I start seeing a Chiropractor, do I have to keep going forever? No. There are several levels of care that can be addressed through chiropractic. We will discuss your options with you to help you choose which level you wish to have. Many patients do come in for periodic ‘oil change’ visits, and find these visits are beneficial. However, if you would prefer to only come in for injury care, please let us know your choice. What is Active Release Technique (ART) and will I require this? One modality that is gaining lots of attention in healthcare and sports injury is ART. When tissues become injured, the body attempts to repair the injury. Unfortunately, the healing process has a tendency to create adhesions, which effectively causes tissues to ‘stick’ to one another, thus impeding the proper smooth function of those and surrounding tissues (which increases the further risk of injury). ART works by eliminating the adhesions, allowing the tissues to function properly. There is occasional discomfort associated with ART, but the results are often quite rapid, allowing patients to return to their usual activities quite quickly. If you require this treatment it will be recommended on your information sheet. What are orthotics and why would I need them? A problem with your spine, hips or knees may actually originate with your feet. After all, the feet are the foundation of your body, and just like with the foundation of your house, it needs to be solid. After the age of 25, 85% of us will develop pronation (turning inwards) when we walk. Orthotics provide the necessary support to the arches of our feet, which have a strong affect on our ankles, knees, hips, and all the way up the back. Our Kinesiologist, Keri-Lyn, will use the results of your foot scan and gait analysis to determine the right orthotics for you. 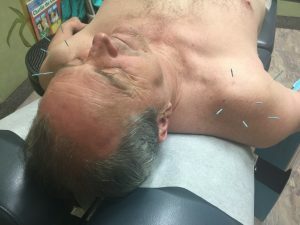 How would Acupuncture benefit me? We may recommend acupuncture for you as a form of pain relief. It is particularly effective on acute injuries (for example, recent ankle sprains) but is also effective in treating many chronic conditions. Dr. Barbara Rodwin chooses the specific point for needle insertion based on your health history and the corresponding areas of your body,and the condition being treated. Should I also be seeing a Massage Therapist? You may get benefit from seeing a registered massage therapist. It is especially recommended for those who have very tight musculature that may be inhibiting movement. Additionally, because muscles cross joints and attach to bones, a problem within your spine may be partly caused by a muscle that is too tight and pulling the vertebrae out of place. Massage can alleviate some of this tightness, which in turn will allow Dr. Barbara Rodwin to apply more effective adjustments.